The multiband fan dipole has always been a popular antenna choice for getting on several bands with a single feedline and without the need for an antenna tuner. The height is limited only by the nearest tall tree and the cost of the antenna is minimal. The antenna is also rather stealthy – especially if 16-18 gauge wire can be used in sub 200 watt installations. The antenna basically consists of two to five or more distinct half wave dipoles which are mounted to a common parallel feedpoint so that a singe feedline can be utilized. Some nice designs are easy to find on the internet or in antenna handbooks. Most designs now suggest (based on Stanford Research Institute data) that the feedpoint be separated by as much as 5.5 inches between dipoles and that the lower frequency (longer) dipoles can be about 4% shorter than the 468/frequency in Mhz would dictate whereas the higher frequency (shorter) dipoles need to be about 4% longer. Many designs also recommend the controversial “ugly balun” choke in the design which is nothing more than 18-21 feet of coax close wound on a 4” or greater non-conductive form at the feedpoint. There are certain downsides of the traditional fan dipole in that the top wire must often support the entire weight of the antenna as well as the balun. The need to ideally spread out the feedpoints by up to 5.5 inches also makes the feedpoint area rather cumbersome. Complicated spreaders must also be used in order to keep each dipole taut and well separated when there are only 2 end attachment points. There also can be some interaction among the dipoles and some detuning may occur if a dipole is included which is a frequency multiple of 3 from a longer dipole in the system (3rd harmonic). For example a 30 meter, 15 meter and 6 meter ½ wave dipole may not be possible if an 80 meter, 40 meter and 17 meter dipole exists. A possible match may be obtained on 30 meters, 15 meters and 6 meters using the existing longer dipole but testing is required. 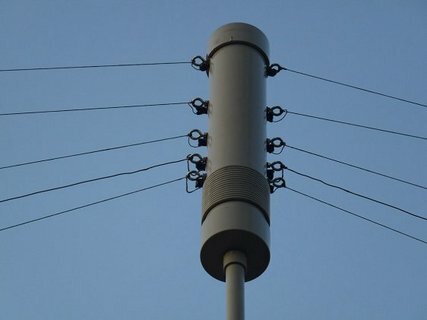 Finally, it is difficult to trim and tune the antenna, since a single rope or rope-pulley system supports the entire array and it must be completely taken down for wire tuning or repair. I am just getting back on HF after a few year hiatus and have moved to a neighborhood with some antenna restrictions. My rig is a Yaesu FT-857D and Astron 30 amp power supply. 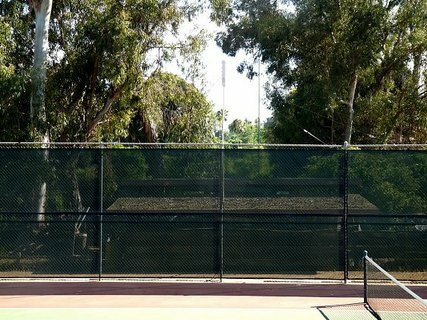 I have no tall trees on the property but do have one large feature on the property – a 45 year old tennis court with 12 foot fencing all around it. 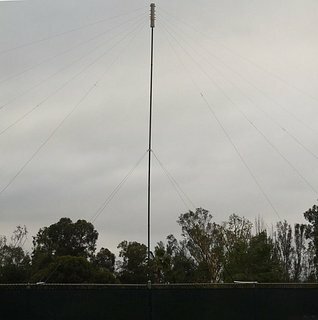 Each long side of the fencing is 120 feet total (a nice sounding number to dipole fans). I decided to try an inexpensive antenna design as a starting point “just to get on the air”. I figured that if I lashed a 10 section of schedule 40 PVC pipe to a central fence support with hose clamps, I could get an inverted-V up at around 20 feet at the center (not an ideal height for DX, but certainly usable). I then figured that I could use the dipoles themselves as “guys” for the central support if at least two of the dipoles were attached on a short offset support on both sides of the fence. The other dipoles could be “bungeed” directly to the fence mesh to keep them taut. The advantages of my Fence Fan Dipole (FFD) design is that just about any sturdy fence that spans the linear distance of the lowest band can be used. 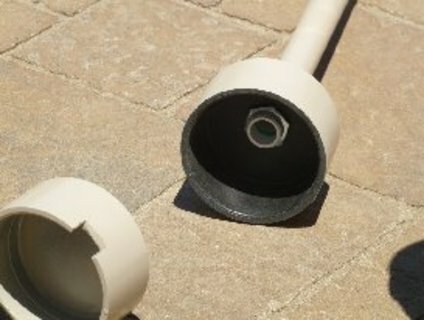 The center feedpoint and balun can be made from a single two foot section of 4” drainpipe with end caps for weather resistance. This could be attached and supported atop a central PVC support pipe with appropriate threaded plumbing adapter and an electrical metal threaded nut available at most hardware stores. See construction images below. 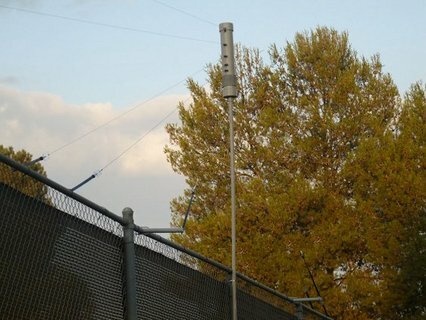 Each dipole is separately lashed to the fence with a bungee-like tarp strap so individual band tuning does not require entire antenna takedown. Dipoles can be easy attached and changed at the retention/ relief posts along the drainpipe for testing, experimenting and possible future repairs. Finally, excellent spreader distances between dipoles at each endpoint can be achieved. RG-8X coax and PL-259 connectors with adapters were the only ham radio specific parts. 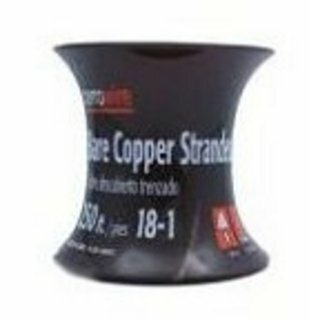 1) 18 gauge bare stranded copper “ground” wire is about $17 for 250 feet and worked extremely well. The 250 feet was just a few feet short for all dipoles so I made my 17 meter dipole from heavier bare copper stranded antenna wire I had on hand. If any of the copper is tarnished, it can be quickly rejuvenated by soaking in a few of ounces of vinegar with a half teaspoon of salt added. This allows the copper to be solder-ready in the necessary spots. 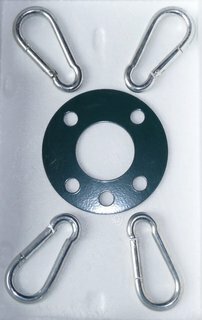 5) Four short 18 inch pieces of PVC to be use as fence “guy” standoffs along with four U-Bolts for attachment – see close-up image. Construction is quite straightforward if you study the images above. I separated the 80 and 40 meter dipole eyebolts by the full 5.5 inches. I compromised and separated the 40 and 20 meter dipoles by 4.5 inches, 20 and 17 meter dipoles by 3.5 inches and the 17 and 10 meter dipoles by 3 inches. 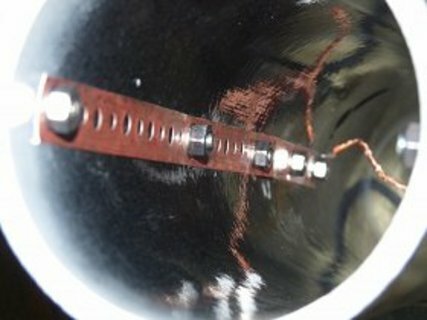 Each of two copper clad straps run the length of eyebolts along the inside of the ABS pipe. The coax lugs are attached at the eyebolts closest to the “ugly balun”. 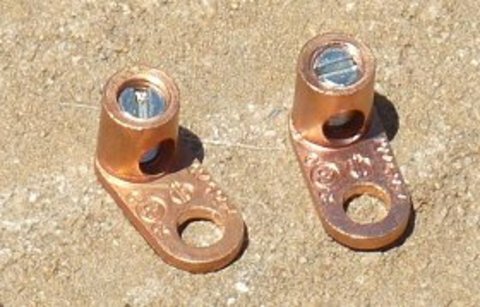 Lock washers are used between the interior nut and the copper strapping. 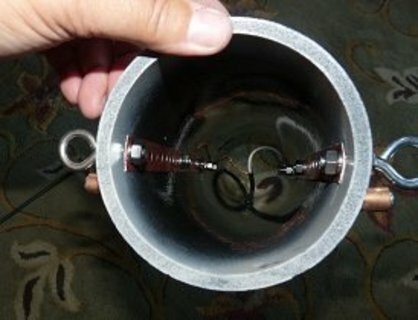 The balun itself is about 16 turns of RG-8X (21 feet) with epoxy used to seal the two inlets. 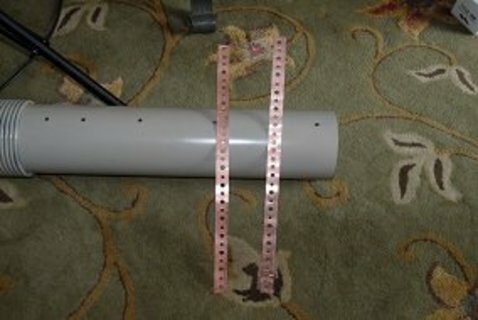 The RG-8X then runs down the inside of the PVC support pipe. I used a barrel SO-239 at the bottom of the support pipe for convenience. I painted the coax, the ABS pipe and PVC all brown to keep things stealth. A note about using two of the dipoles as “guys” to keep the flimsy PVC support pipe upright: If I had bungeed all dipoles to the fence mesh itself, I would not have had support in the “Y” plane to keep the PVC support pipe upright. I could have used two opposing rope guys for this purpose, but didn’t want to have any ground mounted supports. So I fashioned 18 inch fence top extenders by grinding a corresponding arc in an end of a piece of PVC and used a U-Bolt through the PVC to create a sturdy standoff from the fence. Good “Y” plane support can be achieved by bungeeing two of the shorter dipoles on each side of the fence with these extenders. This has kept the central PVC pipe quite vertical with resistance to winds we have seen to date. The completed antenna is so stealth, it is quite hard to photograph. Hopefully this image with give you a good idea of the appearance of the support and at least of 3 of the 5 dipoles. The FFD has obvious downsides – non-portability, height compromises and possible interaction with the fence if it is metal. But initial testing has been quite good. During an hour of operating the IARU HF championship July 14-15, 2012, I worked 6 countries on 4 bands including Aruba, South Cook Island, Japan, Argentina, Canada and Mexico. The antenna has acceptable SWR on 80, 40, 20, 17, 10 and 6 meters and contacts were made on all bands without an antenna tuner. 15 meters is usable. I may add a tuner to get a better match on 15 meters and more bandwidth on 80 meters. It is unclear if a dedicated 15 meter dipole would have worked fine or if there would have been detuning - I haven’t tried it. I have no illusions about DX worthiness of this antenna. But dipoles and inverted-V’s can make good antennas – especially on the lower frequencies where multi-element antennas are not practical. The multiband variety of the dipole such as that described here, when well tuned, should not suffer appreciably in performance over a monoband dipole at similar height. The advantages of a single feedline cannot be overemphasized. I have been very happy with the Fence Fan Dipole I first erected in July 2012, but wanted to increase the height of the central support above the original 20 feet. I had also received a few reports of some RF in my transmit audio and decided that I wanted to add a real 1:1 balun at the feedpoint. 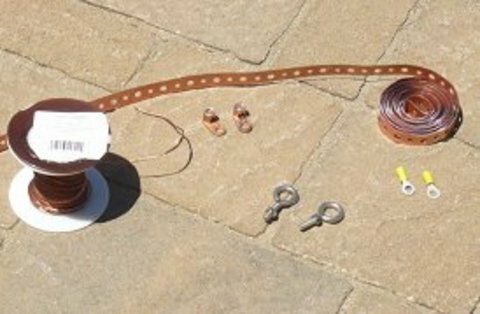 The “Ugly Balun” choke type balun using coax windings is great for a single band antenna, but the number of turns determines its effective choke frequency – so it is impossible to cover 80 through 6 meters with one coil of coax. I had heard wonderful reports of the baluns designed by the late Jerry Sevick W2FMI. 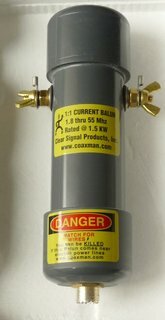 These designs were now being made by Mike Lapuzza, KM5QX who runs Clear Signal Products at website www.coaxman.com. Mike was kind enough to make a special version of his 823A balun without the eyebolts so that it would fit inside my PVC drainpipe (see original article). This fit inside the pipe at the same location where the external coax windings were removed. The balun worked like a charm and I have since received nothing but great audio reports – even after adding an Elecraft KPA500/KAT500 amp/tuner combo to my station. Mike hand makes the baluns, so he is very open to special orders like mine. In researching lightweight support poles, I found John at http://goverticalusa.com. John sells new and used surplus military style fiberglass and aluminum 4 foot mating mast sections. The aluminum and fiberglass poles can be used in combination and fit together perfectly. To get to my goal height of 36 feet, I decided to use 6 stiffer aluminum sections for the lower mast and 3 fiberglass sections for the upper mast. My reason for using fiberglass was so that there were no metal sections at the top to interfere electrically with the dipoles. John also makes a very nice guy ring which can be inserted at any joint in the sections. I placed the guy ring at 24 feet so that I could guy the mast at that point using some Dacron rope. I fashioned two additional ¾ inch PVC outriggers to the fence to support the ropes from this guy ring in a 360 degree fashion (see final antenna picture). Remember, my lowest 12 feet of mast was solidly supported by hose clamps along the 12 foot high tennis fence. 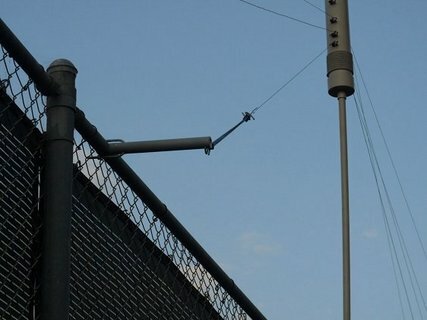 At the top (36 feet), the antenna would be “guyed” in the same way it had always been, by attaching the dipoles to the fence top with tarp style bungee straps (using some PVC outrigger poles at the fence top to keep the antenna balanced at the vertical). With the increased height, I now needed to add some Dacron ropes to some of the dipoles to fan them out properly along the fence. The result has been worth the effort. The only downside of the increased height is that the entire mast would need to be lowered for any work to be done on the antenna’s individual dipoles. 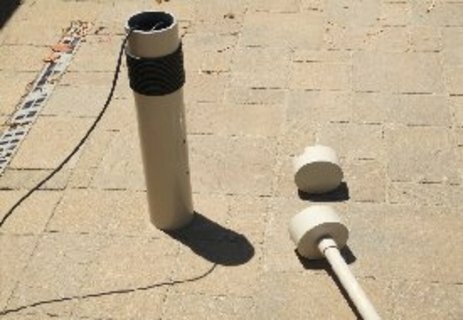 You can’t tilt over 36 feet of military poles without damaging them, so the antenna must come down the same way it went up – by removing (adding) one section at a time from the bottom as you slide the pole down (up) through the loosened hose clamps. Not very elegant but doable with a couple of people. Since the original article was published, several hams have written with positive experiences. One ham fashioned 8 dipoles with one feedline for multiple bands including 15 meters and said that he did not have an issue with both a 40 and 15 meter dipole coexisting (3rd harmonic could cause both dipoles to potentially radiate). So experimentation is the name of the game with this antenna design. by ONAIR on March 14, 2016 Mail this to a friend! by VK3YE on March 14, 2016 Mail this to a friend! An improvement would be to increase the angle between the wires at the feedpoint to make it a shallower inverted-vee. Performance tends to drop off when apex angles get to under 90 degrees or so. Even poles of 2 or 3 metres high at the ends can make a difference. by KB2DHG on March 14, 2016 Mail this to a friend! OUTSTANDING Article! 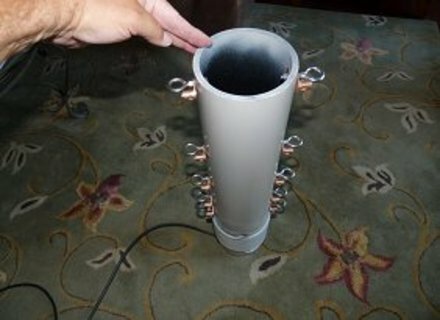 I love home brew antennas and am going to give this one a try! Bravo! by K8QV on March 14, 2016 Mail this to a friend! First I'd have to try that huge fence as a ground plane for a vertical. by KB4QAA on March 14, 2016 Mail this to a friend! by KJ4DGE on March 14, 2016 Mail this to a friend! Love-in it! Oh crap I sound like a Micky Dee ad....Great article. keep em comin! by KK5JY on March 14, 2016 Mail this to a friend! Building antennas like this can be really fun. And this type of project gives you a lot of bang for very few bucks. That makes it very rewarding, as well as a good investment. The author mentioned that he wasn't trying to make a DX antenna, but an inverted V can have some amazing DX abilities, even at modest heights. A resonant multiband antenna like this can have performance that rivals much larger (and more costly) antennas. One nice feature about this kind of multiband antenna is that it is resonant on several bands. This lets you avoid the losses associated with high SWR levels on your feedline. The feed system shown here is the same kind used on the hexbeam, which has similar advantages. Depending on the bands you want to emphasize, you can run the fan in either direction. You can put the longer wires on top, so that they are higher than the wires for shorter wavelengths, or you can put the longer wires on bottom provided you have enough elevation above ground. That lets you choose the bands that benefit from the larger V angle, by placing them higher in the fan. If you put short wires on top, you pull them out and up with extra rope. This kind of antenna would be a very nice match for just about any height of fiberglass mast. Nice job, and nice write-up. by W3TTT on March 15, 2016 Mail this to a friend! OK - nice work. I especially like the notes regarding spreading the feed points and adding / removing 4% as appropriate. However, I see trees in the last photo. Trees? Antennas! If i was there, I would put an 80M inverted vee dipole feed by ladder line, and use a good tuner in the shack. by KW4JA on March 16, 2016 Mail this to a friend! My property doesn't have a fence but I do have several fans. by KD1I on March 16, 2016 Mail this to a friend! by JS6TMW on April 10, 2016 Mail this to a friend! "Works just fine. I am currently not using a balun. GASP ! EGAD! How could it possibly work? 73, Jim "
LOL! Yesterday I removed the feedpoint toroid balun from my fan dipole (40/20/17) and lo and behold I am making DX contacts on 17 where before the SWR was sky-high. I am armoring my personal ABM (Anti-Balun Movement) against an incoming barrage of feedline common-mode theories. by W6HDG on April 13, 2016 Mail this to a friend! I just heard from a friend that this old article got re-posted. I guess they don't tell the author. I want to thank you all for the nice comments. But....please disregard this article and just buy a Steppir DB18 like I did last year. Hi hi. I still have the fan dipole up and it does work quite well -usually about 2 S Units below the Steppir up at 65 feet. On 40 and 30 the sigs can be closer. On 10-17m the difference can be more dramatic as the Steppir is closer to a full size 3 element beam. But the dipole is a very quiet antenna and I use it daily to check out band activity quickly.